Tips and techniques for creating a healthy, energy-efficient, sustainable, net-zero-energy, passive, carbon-neutral, and regenerative built environment. Producing drinking water is extremely energy-intensive. ASHRAE reports that energy costs make up 80% of the typical water bill. Efficiency is a first step, but we really need to use locally produced, non-potable water to be sustainable. Our chief uses for non-potable water are toilet flushing and irrigation. 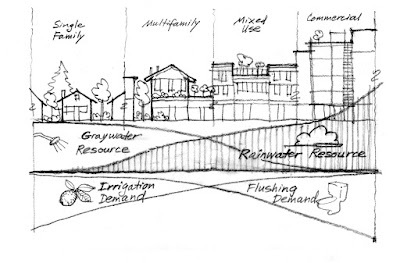 The real excitement comes from integrating architecture into the water cycle. 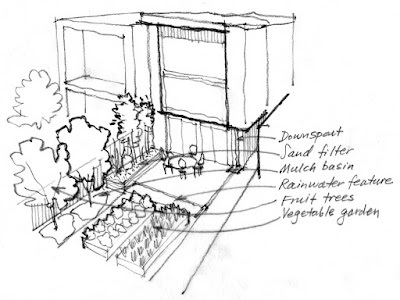 With architecture we “harvest” two sources of non-potable water: rainwater and graywater. Architectural expression of rainwater collection and storage. Buildings already collect rainwater in leaders and downspouts. Making water part of schematic design leads to rooflines that take on a receptive posture and concrete tanks that serve as basketball courts. That brings us to graywater. Graywater is bathwater (plus bath sinks and showers). The English spell it greywater. The most harmful things in graywater seem to be detergents and cleansers, but graywater also contains bacteria from our skin. Avoid storing graywater unless it’s treated in an appliance like the BRAC, Pontos Aquacycle, or Aqus. These units filter, chlorinate, and store the water for toilet-flushing. San Francisco and Mendocino County are taking the lead in permitting these appliances in California. Reconnect architecture with horticulture. A better use for graywater may be irrigation. Laura Allen of the East Bay’s own Graywater Guerillas explained that organic particulates in graywater are good for soil health, turning a waste product into a resource. When our grandparents “threw out the bathwater,” they threw it onto the vegetable garden. We are seeing a resurgence of residential horticulture, using mulch basin technology to distribute the graywater with no storage. The gardens of the Sunset Idea House in San Francisco are irrigated with a system designed by the East Bay firm WaterSprout. Regulations. Appendix G in the California Plumbing Code (written by sewage disposal engineers, not horticulturalists) regulates graywater. Designing a permittable graywater leachfield makes building your own moonshine distillery seem cheap and easy. The absence of realistic code guidance at the scale of single-family homes has led to elegant R&D by rogue horticulturalists, explained in excellent detail on the web. The Arizona and New Mexico graywater codes allow these clever systems, and we need to pressure our East Bay jurisdictions to emulate them. Texas Manual on Rainwater Harvesting, online, now in its 3rd Edition. Arizona Graywater General Permit provides guidelines and requires no review or inspection. Until the energy glut of the 1900s, architects designed the architectural shell to reduce loads. Reducing the cooling load has a positive ripple effect through all the systems of a building. Cooling equipment can be downsized, perhaps crossing a threshold to a less intensive cooling system. Fan power and duct sizes can be reduced. Less space is needed for mechanical equipment. One of the easiest ways we can do this again is by keeping the sun out of windows. Properly sized overhangs are a great place to start with sun control. A fixed overhang will admit low winter sun when the radiation might be useful for heating, and exclude high summer sun when the indoor climate is too hot already. How do we properly size overhangs? First, we have to know what seasons need shading. For this, a good tool is Climate Consultant 3 software developed at UCLA. The newest version works on both Mac and PC systems, so there is no excuse for not using it. A free copy can be downloaded from: http://www2.aud.ucla.edu/energy-design-tools/. The program’s Sun Shading Chart will show graphically which times of the day and year that solar heat is useful for the indoor climate. At my office, we start each project by printing charts from Climate Consultant to guide our schematic design. In SketchUp, I can quickly draw a test overhang and then turn on the shadows. Using the sun shading controls, I can move the sun through the seasons and watch the overhang’s shadow move up and down the window below it. Then I resize the overhang to shade farther into spring and fall, if that’s what my Climate Consultant chart indicated. Using shadows in SketchUp, it’s easy to see that some orientations have no overhang solution. Even vertical fins cannot keep low sun out of windows that face due east or west. On a current project, we designed operable, louvered shutters that the occupants will close at night before leaving the building, and open in late morning during a coffee break. We cut the simulated cooling load by 50% by shading these windows between sunrise and 10:30 am, when the sun is too low for overhangs to work. More synergies can come from such a layering of the window openings: the shutter design creates the opportunity for a lockable security system over the east windows, and the potential for leaving the windows open at night for night-ventilation cooling. We can pay for the shutters using savings from the mechanical system. Sun control is usually one of the most cost effective measures to squash the loads on mechanical equipment, which is the key to having a low-energy building. Using Climate Consultant 3 and SketchUp, shading design becomes very straightforward. The next step is simulating the shading design in an energy model to see the ripple effects throughout the building system. Imagine on a cold winter day, a house can be heated solely by people, lights, equipment, and sunshine. A Passive House is a building with enough insulation and air-tightness to eliminate the need for conventional space heating. After the 1970s energy crisis, architects in the Northeastern U.S. developed “superinsulation” (e.g. double-stud walls) and fresh-air ventilation. In the last fifteen years, European architects have perfected these innovations to create the Passive House Standard. This architectural formula will become part of the European Union’s building code by 2012. It could also be the most elegant and inexpensive means to reduce building energy use in the Bay Area. How does it work? As we increase the insulation and air-tightness of a building envelope, the building becomes more comfortable and saves more energy, but it also becomes more expensive to build. However, there is a threshold of insulation and air-tightness at which the heating system becomes superfluous, and the total cost falls to the price-point of conventional construction. This is the key to designing a Passive House: simplify the mechanical system to pay for envelope upgrades. It gets better. Because insulation blocks sound, the interior of a Passive building is quieter than a conventional building. Being inside engenders a feeling of serenity to know that the building is perfectly balanced between internal and external heat. Considering the building metaphorically, comfort is no longer attained with fire, but with breath. To cool off, one opens the windows. To warm up, one closes them. Passive buildings are also healthier than conventional buildings, because they are flooded with filtered outdoor air. By using a fresh-air ventilator with heat recovery (an HRV or ERV), a Passive House loses less heat than a conventional building that is fully buttoned-up. Furthermore, the ductwork can be smaller and simpler, since it only provides fresh air. So how do we design Passive buildings for the Bay Area? We turn our typical design sequence on its head by starting with a piece of mechanical equipment (the HRV). Next, we “size” the architectural shell to meet the heating loads, the way an engineer would have sized a boiler in the past. The calculations can be done on a napkin, but planning software is available. See the resources listed at the end of this article. East Bay architect Nabih Tahan used the “Passiv Haus Planning Package” (PHPP) software to design a Passive House in Berkeley. He raised and remodeled a typical early-1900s bungalow. When I paid him a visit recently, I expected to see thick walls and high-tech windows. Surprisingly, Tahan used 2x6 studs at 24” centers, 2” of rigid insulation over the original 2x4 walls, and conventional windows. He paid careful attention to airsealing by caulking and foaming gaps in the plywood sheathing (continuous through the attic), and gasketing under sill plates. Ironically, Tahan had trouble passing the Title 24 Energy Code. California’s current Alternative Compliance software cannot understand a house without a heater, so in order to get his certificate, he had to install $35 electric baseboards. When a basic gas furnace costs $8,000 and radiant floors cost upwards of $20,000, the upfront cost advantage of Passive buildings is clear. As if we needed more incentive, forthcoming revisions to the Title 24 Energy Code will mandate mechanical ventilation for houses—the Passive House essential. All that’s left to do is seal the gaps and get rid of the heater. Nor. Cal. Solar Energy Assn.